Make beats you´ve never heard before. 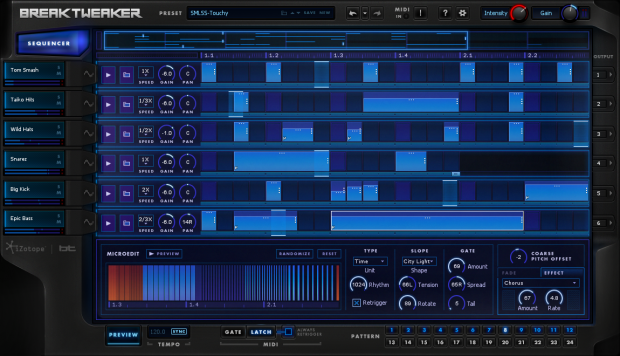 Built on a futuristic MicroEdit Engine, BreakTweaker turns everything you know about rhythm on its head. Designed by BT and developed by iZotope, BreakTweaker is not just a drum machine: it´s a drum sculpting and beat sequencing environment that blurs the line between rhythm and melody. Give your beats an ever-evolving depth that gets better the longer they play. Use rhythmic slicing to drive everything from pitched melodic lines to sweeping rhythmic overtures. Top it all off with the best drum sample library in existence, curated by BT, iZotope, and top producers today. Explore a new era of rhythmic possibilities with this forward-thinking and forward-sounding instrument. Experiment with stunning content: Explore presets, drum samples, and wavetables designed by today´s top musicians and DJs, including BT. BreakTweaker is the beat machine of the future. Powered by three distinct modules, the Sequencer, the Generator, and the MicroEdit Engine, it´s a wildly creative rhythmic instrument that can be used with any DAW and MIDI controller. For instant gratification, get started with the diverse presets and content in the Factory Library, a showcase of BreakTweaker´s breadth and sonic capabilities. When you want to get deeper, forge new sonic weaponry with BreakTweaker´s paradise of tweaky controls and settings. Assemble pattern-based beats in the Sequencer, which features six tracks for layering your sounds. 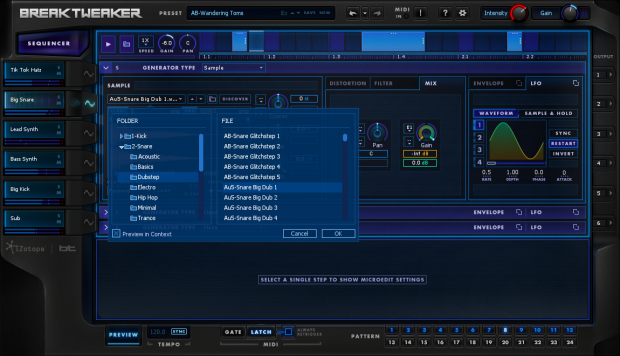 The Sequencer can store up to 24 different step patterns, launchable via MIDI for on-the-fly remixing. Design beats that evolve over time with BreakTweaker´s advanced isorhythmic step sequencing, which makes it possible for each track to have a unique tempo and step length. Ever heard a 7/8 rhythm against a massive 4/4 breakbeat? You can here. Once you´ve perfected the ultimate set of drum sounds and sequenced your patterns, it´s time for a whole new method of sound design. Enter the MicroEdit Engine. A "MicroEdit" is the division of a single step within your pattern into potentially thousands of slices. These slices can then be contoured and shaped to create harmonic, pitched, and rhythmic effects, resulting in new textures that add maximum ear candy to your ever-evolving beats. By pushing the limits of the brain´s ability to perceive sound, the MicroEdit Engine blurs the line between rhythm and pitch, inspiring beats you´ve never heard before. 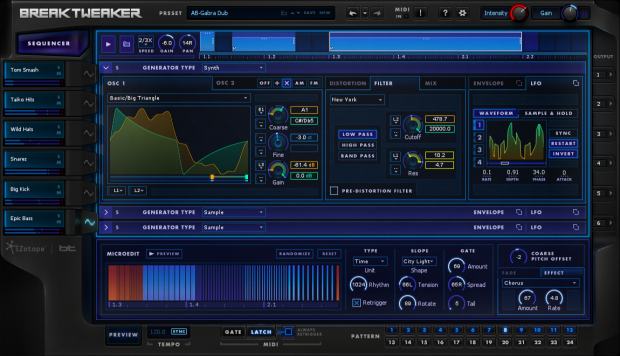 Get even more Sounds with BreakTweaker Expanded, incl. 3 add-on Expansion libraries, suited to a variety of production styles. Experience analog punch with Vintage Machines, rhythmic tension and release withCinematic Textures, and industry-defining percussion with Kicks & Snares by Beatport Sounds. I loved the simplicity of Breaktweaker. I thought that the immediacy of creating beats, and mangling them BT-style was very attractive, and kept me entertained for a long time. For making those kinds of beats, I don’t think there’s anything out there that competes. I loved the layering of samples and synth, that really expands the sonic potentials for your rhythms to limitless. However, I was a little disappointed with the lack of one simple element that I really think iZotope should work on for future iterations. There is NO swing capability. I’m sure it’s to do with the complexities of the Microedit engine, but sometimes you really need some swing to capture groove. A small but necessary element that makes a little dent in the otherwise excellent (albeit pricey) Breaktweaker. Break Tweaker stellt Rhythmen und vor Allem rhythmische Texturen bereit, die man so sehr selten hört. Alle Sounds können schnell und problemlos einfach bearbeitet werden. Die Klangqualität ist exzellent! Für Alle empfehlenswert, die mal andere Rhythmen als BumChaCha erstellen wollen. The Discover feature requires an internet connection.